Rory McIlroy says his caddie Harry Diamond is one of the best in the business. Rory McIlroy has heaped praise on caddie Harry Diamond after his victory at The Players Championship. Diamond, a lifelong friend of the new world number four, has been on the bag for the last year and a half but with McIlroy, until this week, having won just a single PGA Tour event in that time, he had come under criticism from some fans. It had been said that McIlroy needed to employ a more experience caddie in his bid to return to the top of the game but, having put together a stunning challenge to win at Sawgrass, the Holywood man has hit back at Diamond's critics. Who is Rory McIlroy's caddie Harry Diamond? “Harry has been a massive part of this and making me more comfortable on the golf course,” he said. “He’s been on the bag for just under two years, like 20 months or something like that. We’ve got two wins, but I feel like even the experiences we’ve had on the golf course already have been huge." 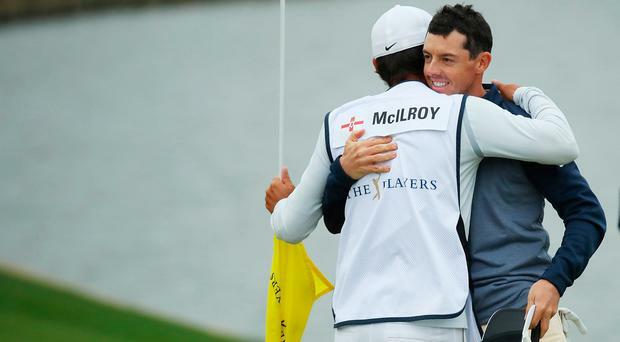 Diamond, himself a plus handicapper, was Rory's best man at his wedding to Erica Stoll but McIlroy says friendship is just one small part of the pair's player-caddie bond. He said: “Harry has been a big part of the success. I don’t think people give...they just think he’s my best friend and I got him on the bag because I didn't want to listen to anyone else. But that’s not true. “Harry is an accomplished golfer, and he has turned into one of the best caddies out here, if not the best. He’s so committed. He’s so professional. And having him by my side out there is so good, and it’s so comforting. “He knows when to talk to me, whenever I need distracting, in terms of not thinking too much about what’s going on around me in the tournament, and he also knows when to say a couple of things. “Yeah, he said a couple of good things to me after the double bogey on four, walking to the fifth tee, but we have a constant dialogue. “We chat, we text every night and sort of where we are, what our game plan is the next day. He’s been a big part of this. “He’s a good player. We’ve played together for so long. We’ve taken lessons from the same guy for 20 years. At Sawgrass, McIlroy carded a two-under 70 to win by one stroke from Jim Furyk on 16-under, joining Jack Nicklaus, Tiger Woods and Lee Trevino as the only men to add the PGA Tour's flagship event to wins in The Open, the US Open and the US PGA. This was one of the sweetest wins of his career. More importantly, he put down a marker with just three weeks to go to the Masters, when he will bid to become only the sixth player to complete a career Grand Slam. He acknowledged the importance, saying: "If I hadn't won today I would have said I don't need a win going into Augusta, but it's very nice to get a win, especially doing it on this golf course, honestly a golf course that played a little bit similar to the way Augusta will play in a few weeks' time. "I can take a lot from this. It's taken me a few weeks to get to this point but I feel like I'm playing some of the best golf of my life right now and I just need to keep going with it and keep doing the same things. "It's very special. I just tried to treat it like any other day. Even though I've had all those close calls this year they didn't mean anything. "If anything they were good for me, I called them 'remote misses', it gives you even more hope to go forward and go again. "I think all those experiences this year led me to this point and ultimately they were good for me because it got me over the line. That gives me a lot of confidence going forward."